CarGurus has 1,223 nationwide MKT listings starting at $3,200. When you’ve got passengers to haul around, why not do it in style with the Lincoln MKT? This sizable crossover debuted in 2010, was comprehensively refreshed in 2013, and still looks suspiciously like a traditional station wagon. The MKT shares its platform with Ford’s more plebian Flex, but it offers a unique, if polarizing, profile with a sloping roofline and a no-nonsense rear end that’s slightly reminiscent of a hearse. Interestingly, the MKT is offered in commercial form as just that, as well as a fleet/livery version that can be employed as a plush airport limo. Other than a minor shuffling of color combinations, the MKT enters 2017 relatively unchanged. 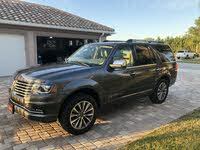 It comes with seating for 7 and boasts available turbocharged power and intelligent all-wheel drive (iAWD), a load of high-end features, and the ride comfort of a full-size luxury vehicle. The MKT is offered in two trim levels: the 3.7L and the 3.5L Elite AWD. The 3.7L is the base trim and comes with standard front-wheel drive (FWD), while the 3.5L Elite AWD trim comes with iAWD, an upgraded turbocharged engine, and a few extra features. 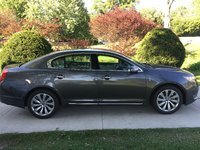 Both offer standard luxury touches like a fixed panoramic sunroof, alloy wheels, a power liftgate, leather upholstery, remote engine start, heated front and second-row seats, tri-zone automatic climate control, and a remote garage-door opener. The standard powerplant for the MKT 3.7L is a 3.7-liter V6 engine, which is managed by a 6-speed shiftable automatic transmission and puts out 303 hp and 278 lb-ft of torque. Gas mileage is estimated at 16 mpg city, 24 highway, and 19 combined. The 3.5L Elite AWD trim comes with a twin-turbocharged 3.5-liter EcoBoost V6 engine that is mated with a 6-speed shiftable automatic to throw down 365 hp and 350 lb-ft. With the turbo, the MKT can reach 60 mph in 6.1 seconds and gets fuel-economy figures of 15, 21, and 17. If equipped with an optional Class III Trailer Tow package, it can handle a maximum of 4,500 pounds. Of the 2 engine offerings, the turbo is obviously the better performer, especially in moving the AWD MKT’s 4,942 pounds. But the 3.7-liter mill is just fine for the usual commuting, soccer-parent, and mall-cruising duties, and it handles the FWD MKT’s 4,702 pounds adequately in normal driving situations. The Drive Control adaptable suspension system that comes with the 3.5L Elite AWD trim provides little improvement over the base MKT’s comfortable and controlled ride, although cornering in either version will produce some distracting body lean. Perhaps the most challenging maneuver, though, is fitting this big crossover into a tight urban parking spot. Here’s where the optional Active Park Assist feature will come in handy. This Ford-branded system will find a suitably sized parking space and steer itself into the spot while the driver handles acceleration and braking. The MKT is outfitted with the recently introduced Ford Sync 3 voice-activated infotainment and telematics suite, which replaces the frustrating and now-defunct MyLincoln Touch system. The 3.5L Elite AWD trim comes with upgrades like a heated steering wheel, voice-activated GPS navigation, heated and cooled front seats, and a THX II premium audio system. A number of optional items can be added, like the safety-oriented Technology package with adaptive cruise control, forward-collision alerts and mitigation, lane-keeping assistance, blind-spot warnings, and Active Park Assist. Notable standalone options include a refrigerated storage bin, rear-seat dual-screen DVD entertainment, second-row heated and cooled captain’s chairs (for 6-passenger capacity), and a powered panoramic sunroof. Besides the government-mandated safety equipment aboard the MKT, look for standard items like 3-row side-curtain airbags, turn-signal-integrated mirrors, front fog lights, and Ford’s popular MyKey programmable speed and audio limiting system that’s designed to keep teen drivers safer. Adaptable high-intensity-discharge (HID) headlights, a post-collision safety system, and a remote antitheft alarm are also included, while inflatable rear seatbelts are optional. The National Highway Transportation Safety Administration (NHTSA) has so far tested the 2017 MKT for rollover safety only, where it earned a rating of 4 stars. The 2016 MKT received the highest score of Good in all tests from the Insurance Institute for Highway Safety (IIHS), although it was not tested on the small-overlap frontal-offset portion, where some competitors have stumbled. Rivals to the MKT include the class-leading Acura MDX, the Buick Enclave, and the Volvo XC90. Both the MDX and the XC90 offer a bit more cachet with their higher price tags, but the 2017 MKT, with a starting price of $43,530 for the 3.7L trim, is seriously up to its job as a luxury-oriented family crossover. 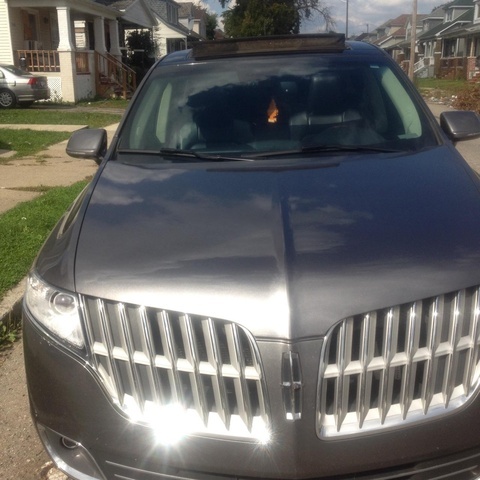 What's your take on the 2017 Lincoln MKT? Have you driven a 2017 Lincoln MKT?